This weeks topic of conversation is Women in Business. And what a line up of four very talented ladies. The Knowing Your Business radio show talk with Hannah Martin, Karen Edgar, Maria Bolton, and Sarah Newton. We discuss advice, inspiration and resources for working Mums, the Smart Woman Academy, the story behind Unity Care Solutions, and helping young people reach their potential. Hannah Martin talks about the ‘Talented Ladies Club’ website and online community for working mums. Hannah launched the business with her friend Kary Fisher to help professional women with children find a way to continue a career/start a business that used their skills, experiences and interest and fit around their family. Karen Edgar talks about the Smart Woman Academy. Maria Bolton talks about Unity Care Solutions. Unity Care Solutions was set up by Maria in 2006. Maria having spent her whole career in the care sector, and has worked closely with the NHS and Primary Care Trusts to build a care and nursing service of enviable quality for the South East. Sarah Newton talks about teenology. Author, speaker, consultant, teenologist and Radio host. Sarah’s expertise is working with gifted and talented young people who have the capacity to become high achievers. She has an ability to raise expectations and aspirations of all young people she comes into contact with. Sarah has shared her wisdom with millions who have tuned into her TV and radio shows, followed her writing and listened to her thought-provoking talks. Hailed as “The Supernanny for Teens” by the TV Times. 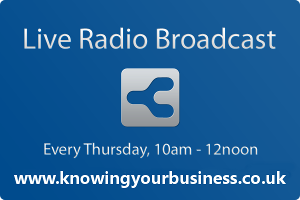 The 26th September 2013 Knowing your business show is presented by Ian Gentles and guest presenter Joy McCarthy.